We walked out of the chippy unable to speak, we had tears in our eyes. It was not the price or an Atlantic Cod shortage causing this emotional moment, we had just said goodbye to Mr Chow, proprietor of Chow’s Chippy, Blackburn Road, Bolton, Lancashire. The Boss has enjoyed Chips ‘n’ a Chat for thirty three years now, whereas I have been buying Chips from Mr Chow even longer, since 1977, don’t tell my Mum, she sent me to ‘FishCo Chippy’ with ten pence for a bag of chips, I preferred Chow’s and naughtily crossed the busy A666 Blackburn Road to get them. At 72, his frying days are coming to an end and he is retiring, we now live over 200 miles away, we know this is the last time we will ever see each other and part with the warmest of handshakes and goodbyes. We have towed the caravan to Clitheroe, Lancashire, twenty miles north of Bolton our hometown prior to moving to Hampshire eleven years ago. After a trouble free journey of just over five hours we pitch up on Edisford Bridge Farm Caravan and Camping site, throw up the awning, scoff some homemade curry and open the wine as we watch the clouds roll in, then unleash torrents of rain which continues for the next twelve hours. The following morning each step on the awning floor produced a flood of water around our feet, imagine a watery version of Michael Jackson’s ‘Billie Jean’ video. We lift the ground sheets and proclaim our ownership of plastic Crocs. People have since pointed out that the photo below looks like I’ve had a little accident. 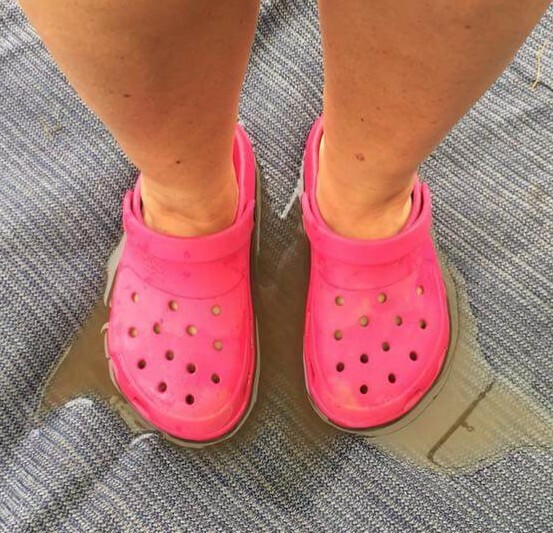 Shoes in hand, we splashed to the car in the Crocs, the joys of a UK caravan holiday. We drove to Mum and Dads and met a new family member, Oliver, my great nephew, not held a baby for ages, I got to do all the B’s, Bottle, Burp and Bum whilst trying to control any ‘clucky’ urges of motherhood, we have reached the age where we can ‘give them back’, wonderful. We spend the afternoon catching up on births, deaths, scandals, holidays and wifi passwords then finish off with tea, evening meal, from the previously mentioned chippy. We divert on route to the caravan via our neighbours from thirty years ago, Barrie and Julie, we reminisce about the old days, how Julie’s waters broke while we were round telling jokes, the baby that obviously liked that joke now having children of her own, feeling old, you bet. Great people, great night. The next day was spent emptying our wallets and purses buying ‘local’ in Clitheroe. As much as possible we like to do this on holiday, but “ouch” it can be a little expensive. 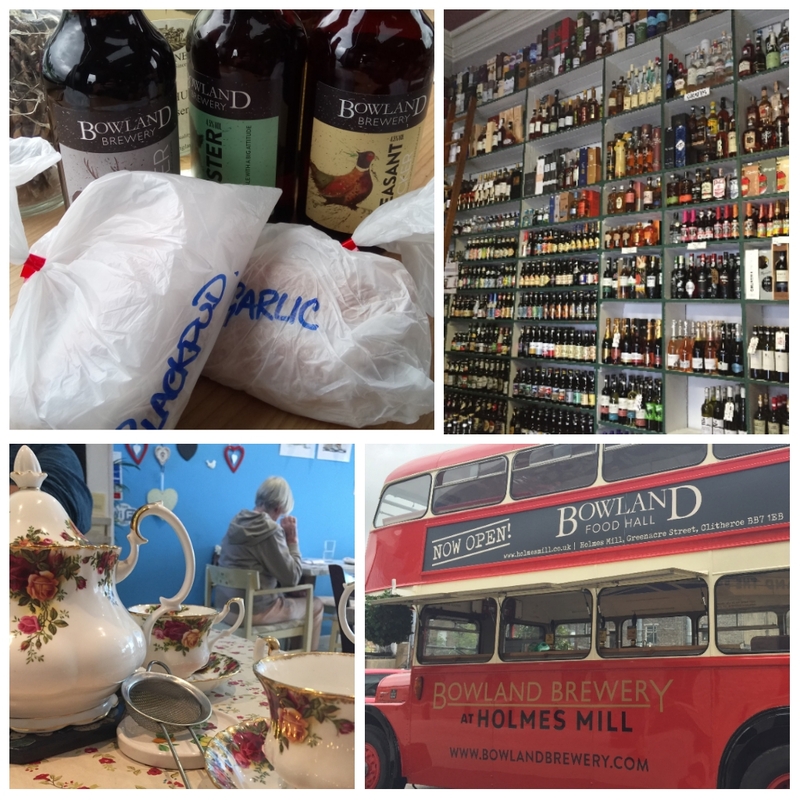 Clitheroe has a few ‘Gems’ when it comes to food and drink, so much so, we repeated this day step by step later in the holiday. Now to say this holiday was wet is an understatement, the BBC forecast symbol for every day was black clouds and two raindrops, when the BBC put two raindrops on the symbol that equates to lots and lots of heavy rain. Every single night was soundtracked by bouncing water and wondering at what point it may shatter through the skylights. It makes you realise what the caravan goes through, parked in storage, when you are back home oblivious to the weather. After five nights, half way, we took the awning down, it was pointless leaving it up, the groundsheet was just giving up pools of water and mud and we felt the ground would drain and dry better without it. It also gave us the chance to lift the corner steadies and move the caravan two feet right to gain a small strip of hardstanding to walk on. The next problem was drying the groundsheets and folding the awning between rain fall or when the wind was below 50mph. Impossible, the awning was stuffed in the boot unfolded and the wet groundsheets followed, resulting in a car that smelt like the sweaty socks of a hundred coal miners. As we get away throughout the year the weather is disappointing, not disastrous, we totally accept a site can only cope with so much water before it starts to creep up the caravan legs, but uncut grass a foot in length is a bit poor and never goes well under a groundsheet. We really feel for people who encounter this weather on their only two week summer holiday, something we have experienced in out tenting days, it can be hard to ‘grin and bear it’ for two whole weeks. A trip into Morecambe provided a welcome relief from the onslaught of the rain in Clitheroe. Nothing tastes better than a bag of chips, straight from the paper eaten on the seafront. 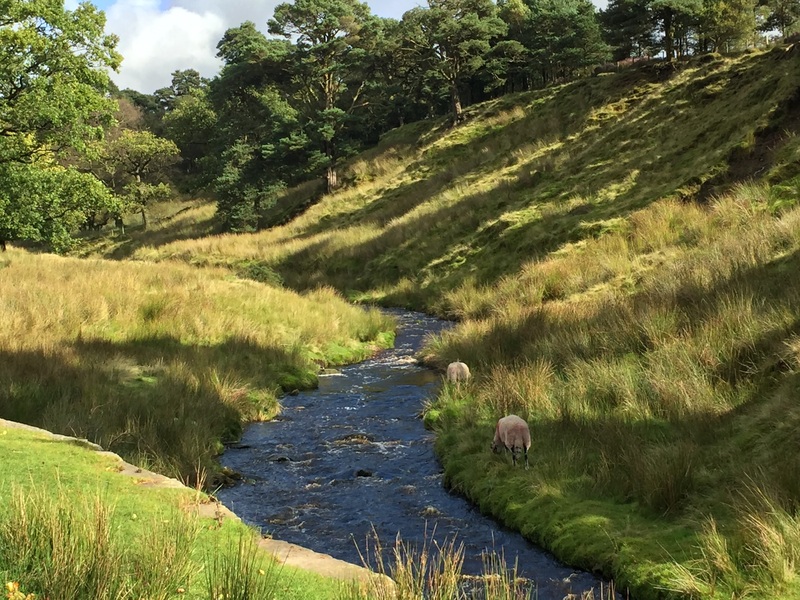 The drive back through Lancaster and the ‘Trough of Bowland’ revealed some of Lancashire’s finest scenery as we swapped the rain of Morecambe for the familiar rain of Clitheroe. For the first time in ages we note a distinct difference between our fellow caravanners on site compared to our usual sites. Typically we will go to Caravan and Motorhome Club Sites, five van Certified Locations or Independent Sites, the caravans are generally less than five years old and almost all have motor movers. On this site, more than half the caravans are over ten years plus and not a mover between them, a few have owners names in the front window and are quickly towed from the storage area on site to the specific pitch by the site owner just in time for their arrival. It seems these are folk who have found their ideal ‘getaway’ and probably have been coming for many years. Wall to wall Lancashire accents with many a rolled ‘R’ to delight our eardrums, and friendly? … we had to walk to the loos well before desperation point to allow for impromptu chatting on route. On our final full day we took a drive north through the Forest of Bowland then turned eastwards and entered … Shhhh…Yorkshire. Now don’t tell anyone we said this, especially any Yorkshire folk, but ‘by-eck’ the Yorkshire Dales are stunning. 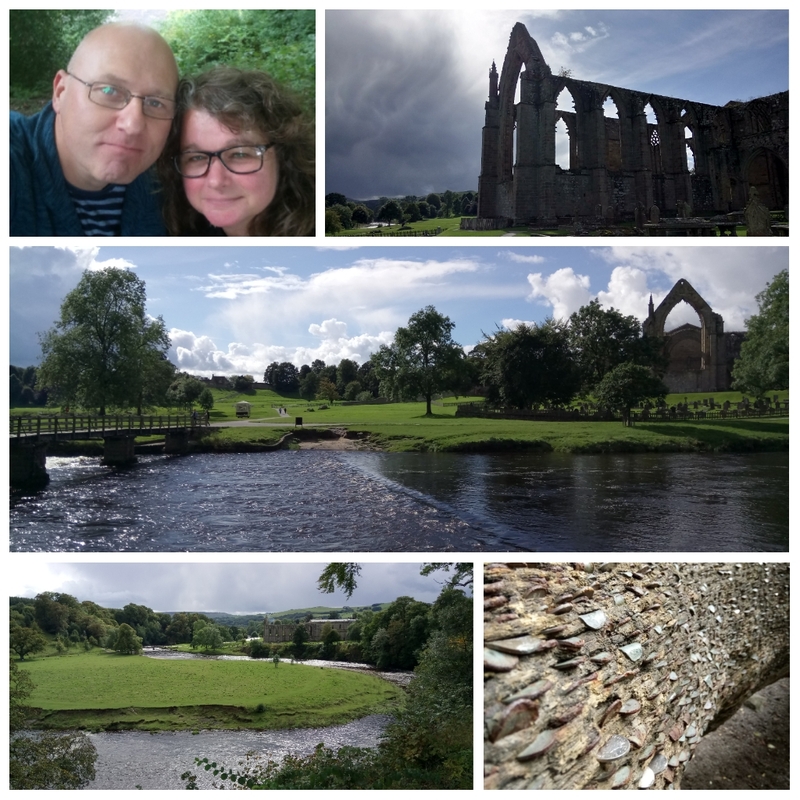 We drove to Bolton Abbey near Skipton, last time we went it was free to park, not anymore, £10 per car with car parks on theme park proportions (hard to imagine Yorkshire people paying £10, they must walk here, only joking, counter Lancashire jokes will be taken on the chin). It is well worth a visit, and the £10. 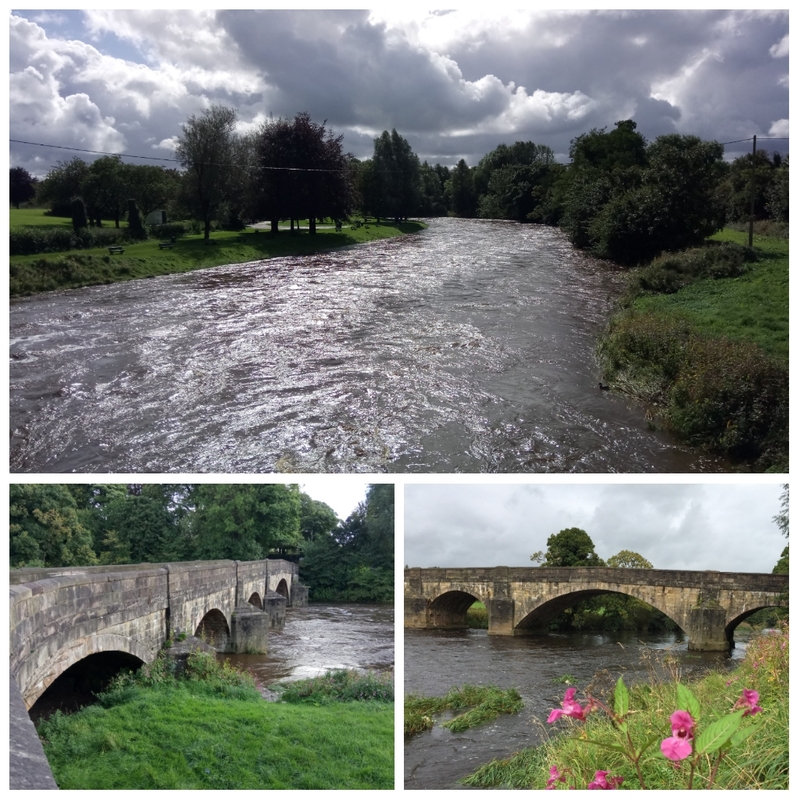 Apparently, it is bonkers busy on a sunny bank holiday with gazebos and barbecues on the banks of the fast flowing River Wharfe, leading down to the picturesque, half ruin, half complete, Bolton Abbey. Mention you have been there to someone in the know and you will be asked if you crossed the river via the stepping stones. Our last evening of the holiday and the sun finally came out. We shouted a few profanities at its late arrival and enjoyed two hours, not sunbathing, but drying groundsheets across the roof of the car and finally, at last, folding up the awning ready to go home. No excuses for the long grass really, is there? You’d hope sites watch the forecasts and plan ahead. We now think Crocs are the best invention since the wheel. Plus, I know how to spell quagmire now, thanks. Greetings from a fellow Lancashire based blogger. I absolutely loved this post. I just did a search on WordPress reader for Lancashire and found this and many other wonderful Lancashire bloggers. I’ve been meaning to put some Lancashire country photos on my website but now I don’t have to. Thank you! Whilst we are born and bred in Lancashire we now live in Hampshire. Loved our trip back home, spoiled only by the rain. Oh no! There’s no share button. Have a look in ‘settings’, then ‘readers’ in your admin dashboard. There’s a place you can add lots of share buttons. I wondered why such a fabulous detailed post like this had so few likes and comments. Please add them as it will increase your followers. My first comment didn’t seem to go through. I had to tell you I absolutely loved this post. Some years after moving south I returned to Preston for a few years. I remember walking down the street one day and realising I couldn’t actually remember the last dry day. Love Clitheroe, though I haven;t been for years. Those pesky Pennines have a lot to answer for, protecting Yorkshire from the Atlantic weather. We only seem to wear coats two days a year down South compared to eight months of the year in Bolton. Thanks for commenting. Touring full time a month after buying your first caravan! That’s brave. Definitely – I am a new blogger and am just trying to find your follow button! I have enjoyed your blogs when they pop up on the Bailey FB page. Yep. Lambert the Luddite has managed to find the follow button – I shall look forward to reading your posts!